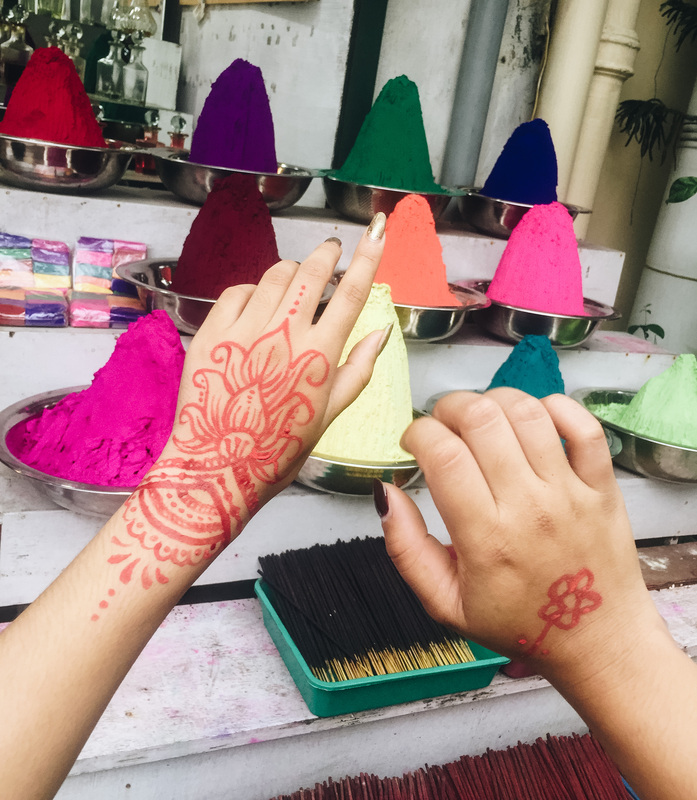 India as a country is exotic, diverse, and full of surprises. It also happens to be gigantic. Every state you travel to is like its own country. While there are a ton of important sites to see up north (the Taj Mahal, hellooooooo! ), quite frankly you’re missing out on a lot that India has to offer if you don’t head down south! Fair warning for my ladies, we experience a high level of heckling from men in Cochin! Especially during the late night. 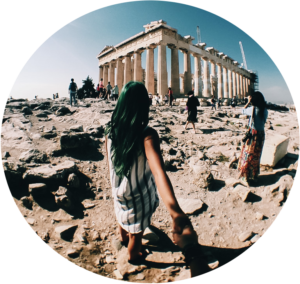 It’s not the safest area for a solo female traveller so keep your eyes peeled and a partner-in-crime close by. Wandering through the Fort Cochin area allows you to see all the hot spots they describe in those Lonely Planet books, but it also allows you to discover the little corners of the city you would otherwise miss. One of these little corners was a fragrance and body paint store! The shop owner allowed us to use red body point made from all-natural ingredients to create our own designs and showed us a bunch of scents that they use in designer perfumes like Armani and Hugo Boss. 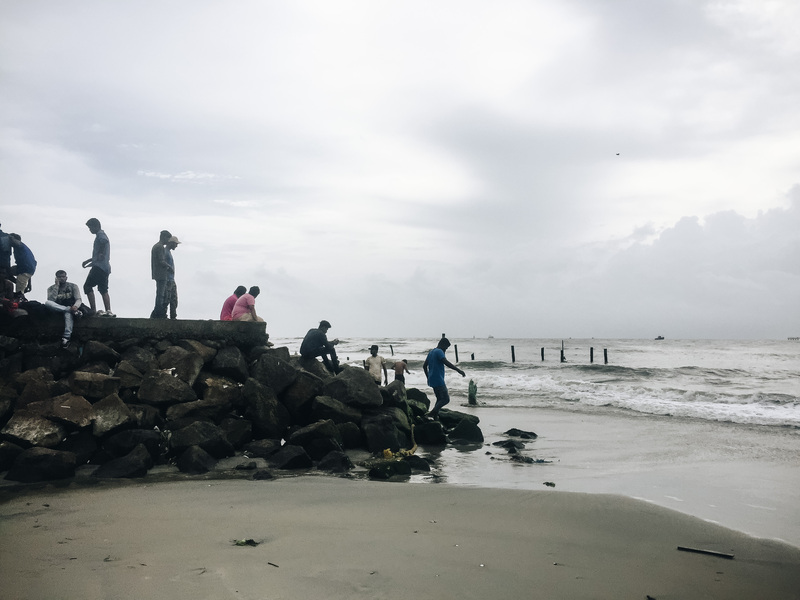 Like the beaches in Mumbai, I wouldn’t recommend swimming at Fort Kochi since the water isn’t all that clean but if you have the opportunity to catch the sun setting behind the Chinese fishing nets, consider yourself lucky! It’s gorgeous. Don’t get me wrong, my cousin and I really wanted to see the elephants. But after a little bit of research, we found out that wild elephants don’t actually allow humans to ride on their backs, and that baby calves are separated from their mothers and have their spirits broken to make them submissive to tourists. Even if we didn’t plan to ride them, we would still be paying to see them. I refuse to support animal abuse financially. Countries like India where the elephant is regarded as a “sacred” animal is no exception to barbaric practices. Elephants are still mistreated even in “sanctuaries”. But this blog post is not for discussing animal rights or to persuade you. There’s a documentary called “Gods in Shackles” by Sangita Iyer that outlines the abuse these gentle creatures face if you want to find out more. And even if you’re not traveling in India, I would still recommend avoiding these so-called sanctuaries in places like Thailand, for example. Matt, the Expert Vagabond, wrote about why you shouldn’t ride elephants in Thailand here. So, if not to see elephants, what exactly did we do in Thekkady? You haven’t tried Indian food until you’ve tried SOUTH Indian food! I’m serious. 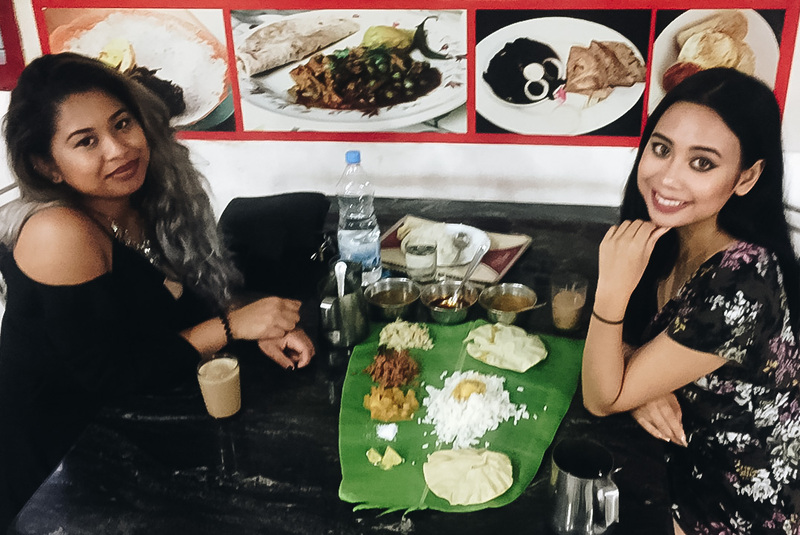 Meals are served on a banana leaf and similar to a thali, you’re given portions of a variety of foods to try. If you’re vegetarian, it gets better. South Indian food is traditionally all-veg so you don’t have to ask your server to make sure. By the way, if you ask for a paratha, you’re probably going to receive a porotha instead, which is a crispier version of the ones they serve in Mumbai. Nicki and I had originally wanted to go south to see the backwaters, but well, plans (and our minds!) change all of the time. 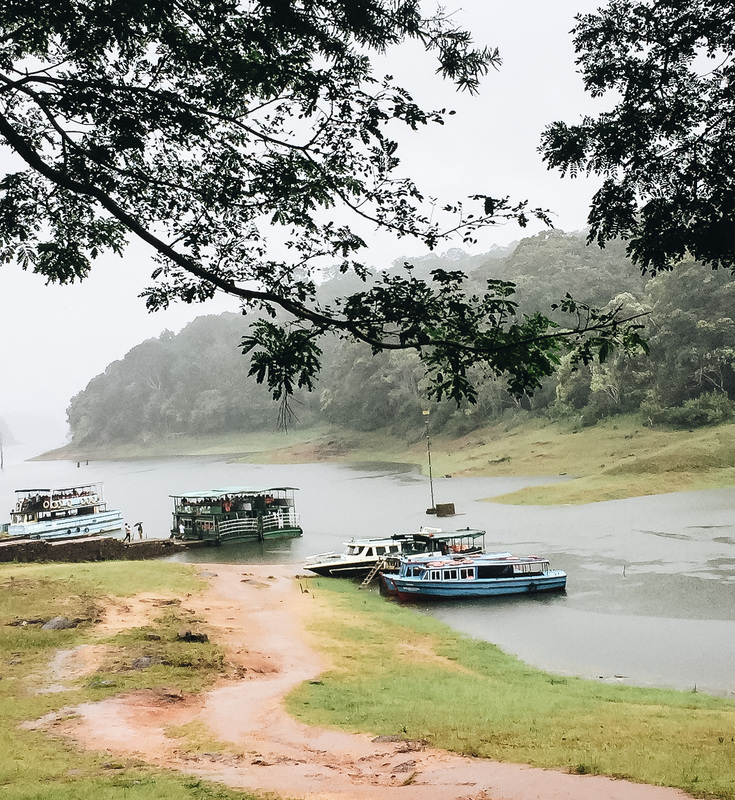 Instead of spending a few days in a boathouse, we decided to go for an hour instead since there’s so much to see in Thekkady. The waters give off this insane haunted vibe since there are crooked branches sticking out of the water. The mist just adds to the effect! My absolute favourite part of our trip! We were able to catch two live performances during our stay in Thekkady. 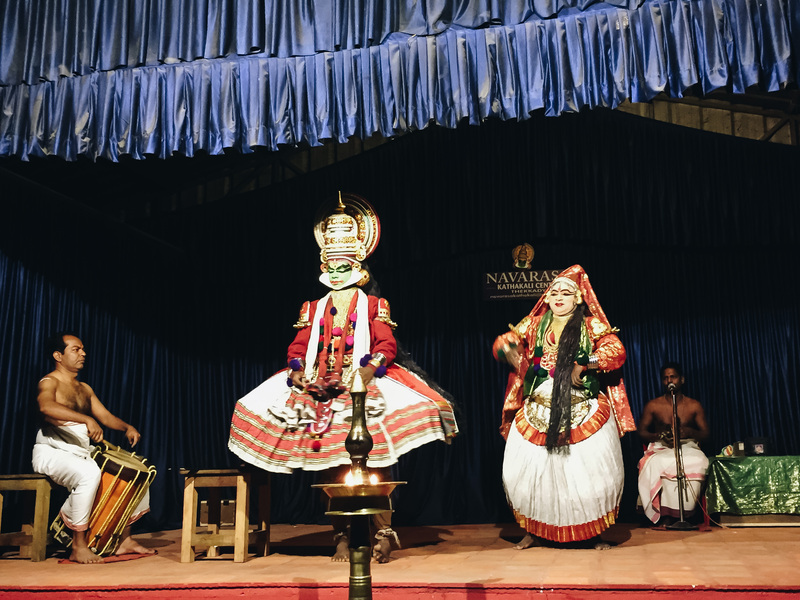 The first was a Kathakali performance (pictured above), where dancers in heavy costume and makeup tell a story to the beat of a drum. It’s an incredibly expressive form of dance. Even their eyeballs move to the rhythm! The second performance was a South Indian martial arts show. It was damn entertaining to watch, since it involves flame hoops and a ton of backflips. 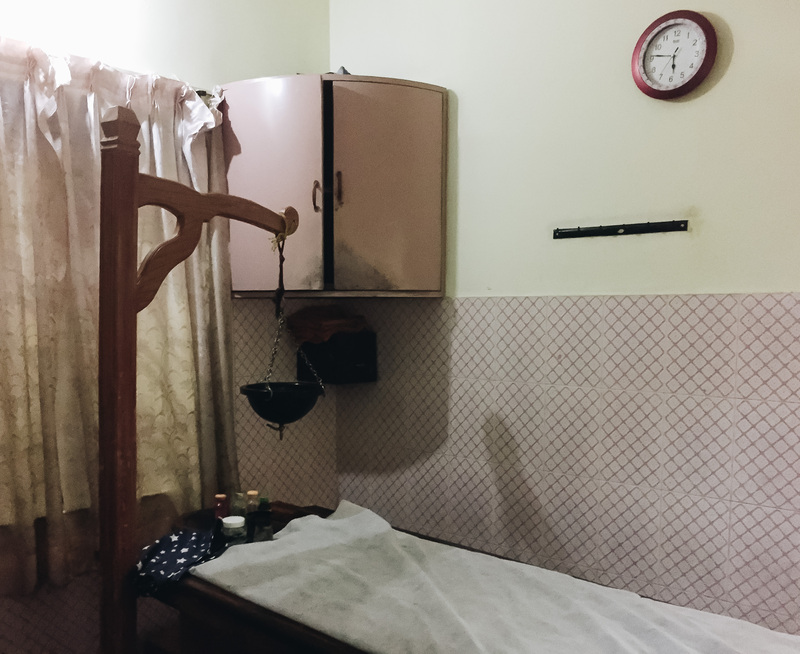 Getting an Ayurvedic massage is like getting beat up but in like, a loving way … That doesn’t make sense but neither did my Ayurvedic massage experience. It was totally different from what I would expect from a massage! Usually I would lie face down first, but here they made me lie directly on my back and began massaging my abs in circular motions (which was weird since I’ve never gotten my abs massaged before). I know you’re supposed to feel relaxed during a 40 minute full-body massage, but everything was so new to me that it was anything but.